In recent days, Bulgaria’s capital Sofia has witnessed a series of student protests and the occupation of university buildings that have injected new life into a persistent anti-government movement that is now into its 138th day. 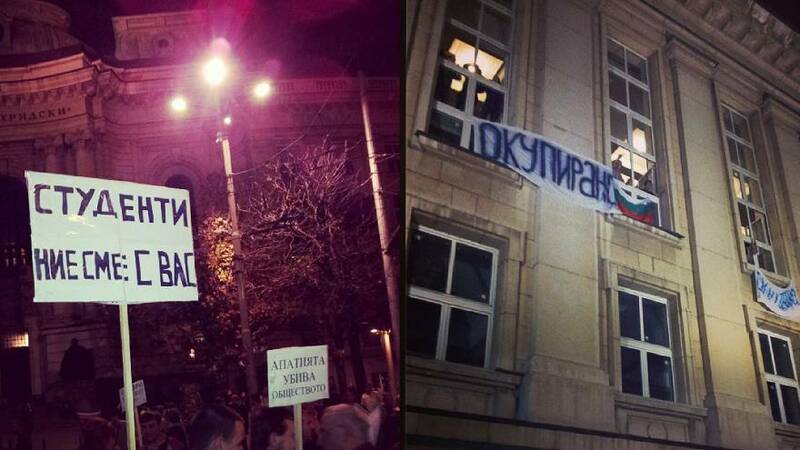 The latest developments started when, on Wednesday October 23, students occupied “Lecture Hall 272”, the largest teaching room in Sofia University’s St. Kliment Ohridski building. The students claim that more than a hundred professors have signed a declaration supporting their occupation. Anti-government protesters were quick to take advantage of this new centre of contestation: on October 26, approximately 1,000 people had gathered in front of the occupied building, chanting “Resign” and “We support you,” according to local media. Bulgarian English-speaking news agency Novonite reports that the ‘Lecture Hall 272’ occupation is a symbolic gesture. It was “staged at a time when Constitutional Court chair, Dimitar Tokushev, who also teaches at the university, was about to give a regular lecture. Students demanded an explanation from Tokushev regarding the Court’s decision to confirm the status of controversial media mogul Delyan Peevski as a Member of Parliament”, a move that triggered a fresh wave of protests earlier this month. The news agency also reports that the protest movement is gaining ground. The ‘Hall 272’ occupiers were “joined Thursday by students from the Faculty of Mathematics and Informatics, and the Journalism Faculty,” according to Novonite. Classes at Sofia University were cancelled on Monday and a general assembly is set to take place in the afternoon. More recently, in Sofia, students from the National Academy for Theatre and Film Arts have occupied its campus. The auditorium of Sofia’s private New Bulgarian University, NBU, is also blockaded. And on Monday morning, students were occupying a lecture hall in a university located in the central Bulgarian city of Veliko Tarnovo. Other colleges are expected to join the movement. On social media, the hashtags #Occupy272 and #OccupySU have joined the traditional #ДАНСwithme hashtag used by protesters for more than 4 months. The evolution of the occupation is not running entirely smoothly: on Sunday a group of men, some middle-aged, some clothed entirely in black, tried to rush the gates of the building of the University of Sofia occupied by the students. You can see the group rushing through the gates, trying to forcefully enter the building and tearing students’ posters in the video below. In the Bulgarian National Assembly, PM Oresharski’s government coalition of the Socialists and the ethnic liberal Turkish MRF party is one seat short of a majority, so it courts unofficial support from the nationalist Attack party which has 23 MPs. Messages of support continue to find their way to the Bulgarian students from other students in Europe. For instance, in this video shot at Aston University in Birmingham, a small group of students have uploaded footage of themselves brandishing banners, European and Bulgarian flags and shouting “Ostavka!” (Resign! ), a popular slogan in the anti-government protests, directed at Bulgarian Prime Minister Oresharski. The protests were originally sparked by the controversial appointment of businessman and MP Delyan Peevski as the new head of the State Agency for National Security in June this year. Public anger eventually led to his removal but the demonstrations have continued, albeit less intensely, and are now calling for the Socialist-led government to resign.